DHA is ultimately found in marine and freshwater algae and plankton, and their primary consumers, such as fish and shell fish, accumulate DHA in their muscle (flesh). DHA is also accumulated by algae-eating amphibians and reptiles, and birds and marine mammals, which feed on fish/shell fish. Conversely, DHA is not synthesized by terrestrial plants and consequently is far less abundant in the muscle tissue of terrestrial herbivores. Although the brains of large ruminants are known to contain relatively high levels of DHA [8-11], the meat and marrow contain very little. Although it has been argued that sufficient DHA could have been synthesized from vegetarian dietary precursors to account for the increased brain growth seen in human evolution, the human ability to convert dietary precursors into DHA has been shown to be very weak [12-15]. "Aquatic plants and animals abound, both in marine and fresh water environments. Special groups of plants and animals thrive along shorelines of rivers and lakes and along beaches and the shores of estuaries, both fresh water and salt water, and on tidal and inter-tidal interfaces between them. These living creatures provide today, and would have provided in earlier times, an abundant source of foodstuffs. Much has been written in recent years about this subject, but we can trace the roots of the discourse back for more than two hundred years. In 1798, Thomas Robert Malthus, an English clergyman and economist, published An essay on the principle of population: As it affects the future improvement of society . Malthus argued that, whereas human populations increase by geometrical progression, their means of subsistence increased only by arithmetical progression. Hence, population size is necessarily limited by the means of subsistence. Two centuries later, the crucial rôle of food in human evolution was the subject of many important studies. Michael Crawford’s and David Marsh’s book, The driving force: Food, evolution and the future , explored many issues around the “land-water interface”. In 1997, Marc Verhaegen published In den beginne was het water: Nieuwste inzichten in de evolutie van de mens (In the beginning was water: Newest insights into the evolution of Man) . In that book, he explored the relationship between human evolution and water, with a dietary emphasis. Others who have been involved in this recent debate have been Stephen Cunnane  and Kathy Stewart of Canada, and Leigh Broadhurst of the USA. Their studies have stressed especially the nutrients in aquatic foodstuffs, some of which would have provided brain-specific nutrition. Broadhurst, Crawford and their colleagues drew attention to the special significance of the long-chain, polyunsaturated essential fatty acid, docosahexaenoic acid (DHA). They showed that DHA was necessary for the development of the large brain characteristic of the hominins. There is a relative lack of DHA in savannah food. They suggested that this would explain the “degenerative evolution” of the brains of truly savannah species and would be another reason why hominins could not have evolved their large brains on the savannahs. On the other hand, the aquatic food chain has an abundant supply of DHA. Early hominins would, of necessity, have made use of the aquatic food chain to make possible the spectacular evolution of the brain and brain size. The claim that the human brain depended on the aquatic food chain furnished independent evidence to support the importance of water in human evolution. Saugstad and Horrobin  both developed further the concept of the relationship between brain growth and function and essential fatty acids. Horrobin reminded us that DHA is not the only essential fatty acid related to brain development and function. Two others are arachidonic acid (AA) and eicosapentaenoic acid (EPA). DHA comprises 8% of the dry weight of the human brain, AA also makes up 8%, but EPA is present in much smaller amounts. These three essential fatty acids play important parts in structural and functional aspects of the brain: both structural and functional rôles are subserved by AA, whilst a structural rôle is concentrated in DHA, and a functional rôle in EPA. Theoretically, if we received in our diet enough precursors of these three essential fatty acids, we could make sufficient DHA, AA and EPA in our bodies, but the capacity for such formation in humans seems to be inadequate. Also, in the presence of much saturated fat in the diet, the incorporation of DHA, AA and EPA into brain phospholipids may be inadequate. Our brain, therefore, needs a direct dietary supply of DHA, AA and EPA. This would obviate the need for the brain to synthesize its own essential fatty acids from precursors such as linoleic acid and alpha-linolenic acid. Dr. Michael A. Crawford of Imperial College London discusses the role of seafood — and the essential fats they contain — in the evolution, development, and maintenance of our brains. Dr. Crawford shares with us a “coastal evolution theory,” the importance of proper nutrition for brain-health, and how it is our mothers who are most responsible for our cognitive abilities. Professor Michael Crawfordm Director of The Institute of Brain Chemistry and Human Nutrition London Metropolitan University talks about the importance of a seafood diet on human health and brain growth. Taurine (T) is an amino acid abundant in seafood which is consumed in large quantities by the Japanese, who are presently enjoy the longest life expectancy in the world, (average 86 yrs among females and 79 among males, the latter which rates second in the world). Populations with a higher number of centenarians than average invariably appear to live in areas where a diet rich in seafood is common, such as Monaco, Macau, Singapore, the Greek island of Ikaria, etc. A study released in November 2012 made the bold statement that taurine is one of the most essential substances in the body. The authors wrote: “Considering its broad distribution, its many cytoprotective attributes, and its functional significance in cell development, nutrition, and survival, taurine is undoubtedly one of the most essential substances in the body. Higher levels of dietery taurine have also been linked to lower hypertension, lower Cardio Vascular disease rates, fewer cases of type II diabetes, liver disease, obesity and much more. It would seem that, as we are unable to synthesise taurine very well, we must rely on a food source in which it is abundant - namely: seafood, especially raw, such as shell-fish. This is surely a consequence of our ancestors high dependence on raw seafood for their survival. 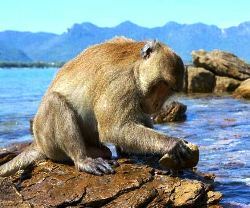 Crab-eating (long-tailed) macaque in Indonesia smashing shellfish with rock tool. Summary: A new study reveals eating fish regularly and taking daily fish oil supplements may reduce the risk of developing multiple sclerosis. Researchers report high fish intake is associated with a 45% reduced risk of developing MS. Eating fish at least once a week or eating fish one to three times per month in addition to taking daily fish oil supplements may be associated with a reduced risk of multiple sclerosis (MS), according to a preliminary study released today that will be presented at the American Academy of Neurology’s 70th Annual Meeting in Los Angeles, April 21 to 27, 2018. These findings suggest that the omega-3 fatty acids found in fish may be associated with lowering the risk of developing MS. In spite our recent reterrestrialisation, shellfish still covers best human dietary needs. Stephen Cunnane 2005 "Survival of the fattest" p.144: "shellfish is best able to meet the adult requirement for these brain selective minerals". Our very small mouth, short & incisiform canines, poor olfaction etc. suggest our ancestors at some time, probably during the glacials, were +/-exclusively dependent on littoral foods (esp.shellfish + coconuts, eggs, turtles etc.). Meat "collection" requires a well-developed sense of smell, which we +-completely lack. But later Homo (heidelb., Hn...) probably got meat from herbivores at the waterside: stranded whales, drowned or trampled wildebeest, herbivores killed in mud or shallow water... Regular fishing was later I guess (with nets etc.). The shellfish-collecting Australians (sapiens) at Lake Mungo c 30 ka re-evolved very thick skulls. Purpose: Previous estimations of the macronutrient, micronutrient and fatty acid compositions of our Paleolithic diet need confirmation from the clinical chemical characteristics of traditional populations that still inhabit the East African cradle of humankind. Method: To estimate e.g. fatty acid and 25-hydroxyvitamin D concentrations and intakes, we collected milk, blood, umbilical cord and adipose tissue samples from several traditional Tanzanian populations, including the hunter-gatherer Hadzabe, the pastoral Maasai and the fishing communities of Chole and Ukerewe. Results: The milk arachidonic (AA) and docosahexaenoic acid (DHA) compositions of some of these tribes exceeded the upper levels of the recommended milk fatty acid compositions that are issued by the various nutritional boards. Conversely, the very high erythrocyte DHA contents in some of these tribes correspond to the lowest incidence of cardiovascular and psychiatric disease, such as observed in observational cohort studies in Western countries. Finally, the 25-hydroxyvitamin D status of 115 nmol/l in these traditional peoples is significantly higher compared to current Western populations, while the amount of dietary vitamin D that needs to be consumed to reach such levels is currently hampered by the upper levels of intake that have been issued by nutritional boards. We conclude that the composition of diets as well as the clinical chemical characteristics, of traditional East African hunter-gatherer populations might be used for the development of randomized trails that aim at the study of lifestyle, rather than single nutrients, in the prevention of chronic degenerative diseases. Remko S. Kuipers (1980) completed his Pharm.D. and M.D. in 2008 and his Ph.D. in 2012. During his studies he became interested in Evolutionary Medicine and contacted Frits Muskiet. Their collaboration has resulted in over 20 Pubmed registered publications. Kuipers spent over 1.5 years of his PhD in the field in East-Africa. Analysis of the 9,000-year-old remains of the so-called Kennewick man who lived in what is now Washington state reveals this actual Paleo man didn’t eat much big game but rather got the bulk of his calories from fish and other seafood. The finding not only throws off some common perceptions of what paleo men actually ate, but also adds some mystery to the fully intact skeleton found in 1996 in Kennewick, Washington. The ancient human, who stood at 5 feet 7 inches, was found in a region where four-footed game were aplenty. So why wasn't he hunting them? "The only theory I can suppose for why he chose not to eat local game(which was abundantly available) is that he had some deeply-held belief system that caused him to reject terrestrial meat from his diet," Henry Schwarcz, professor emeritus in the School of Geography and Earth Sciences at McMaster University, said in an email to Discovery News. "It is hard to imagine how a people could persist in such a belief system as long as these data suggest." Schwarcz added that his research doesn't exclude the possibility that Kennewick Man also ate plant-based foods like nuts and berries (which happen to also be on the Paleo diet menu). Another possibility is that the ancient man may have been killed far from his main home. His remains were found some 370 miles inland -- but perhaps his home was closer to the Pacific Ocean. "Certainly his diet is matched more closely by consumption of marine mammals that live mainly on the coast," Schwarcz said. Schwarcz, renowned for his research in isotopic analysis of ancient bones, based his findings on his analysis of collagen in a small bone fragment from the famous and controversial skeleton. He presented  his work at the recent annual meeting of the American Association of Physical Anthropologists in St. Louis. Previous research has shown that the man died at about age 40. He had lived with an arrowhead stuck in his hip and also suffered from five broken ribs, two dents in his skull and a bum shoulder (probably from throwing so many spears). "He was a strong, robust man (based on the appearance of his skeleton) who had managed to survive at least one attack by another human," said Schwarcz. "He should have been an able fisherman/hunter." Kennewick man is one of the oldest and most complete skeletons found in North America. Recent estimates date the remains to between 8,400-8,690 years old. The skeleton became the subject of an eight-year-long lawsuit between scientists who sued the federal government (along with several Native American tribes) to prevent the bones from being turned over to regional tribes for reburial. In 2004 the Ninth Circuit upheld a ruling that Kennewick Man is not related to any of the present-day tribes and therefore can remain at its current location at the Burke Museum of Natural History and Culture in Seattle. The debate over his ethnicity and origins -- and what should happen to him -- continue today. 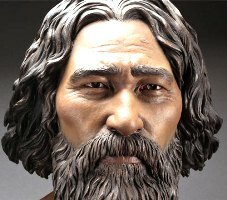 Schwarcz's analysis was surprising since Kennewick Man was found by the Columbia River in an area where big game were believed to be abundant. While the trendy Paleo Diet includes fish on its list of acceptable foods, the diet is also heavy on red meat and other foods like nuts and berries, that our ancestors are thought to have eaten before the dawn of agriculture and animal domestication. Michel Odent has written about iodine deficiency in “The Birth of Homo, the Marine Chimpanzee”. “…iodine deficiency remains a common nutritional deficiency on a global scale. It is the leading cause of preventable intellectual disability. 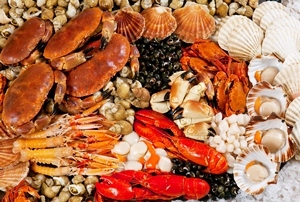 It is difficult for humans to obtain sufficient iodine if their diet does not contain seafood. Further, some common agricultural practices exacerbate the problem: the milk of cows fed with rapeseed meals rather than grass, for example, has an iodine antagonistic effect. 1. Crawford MA, Bloom M, Broadhurst CL. et al. Evidence for the unique function of DHA during the evolution of the modern hominid brain. Lipids 1999; 4: S39-S47. 2. Sinclair AJ. Incorporation of radioactive polyunsaturated fatty acids into liver and brain of developing rat. Lipids 1975; 10: 175-84. 3. Broadhurst CL, Wang Y, Crawford MA, Cunnane SC, Parkington J, Schmidt W. Brain-specific lipids from marine, lacustrine, or terrestrial food resources: potential impact on early African Homo sapiens. Comp Biochem Physiol Part B: Biochem Mol Biol 2002; 131: 653-73. 4. Muskiet FA, Fokkema MR, Schaafsma A, Boersma E, Crawford MA. Is docosahexaenoic acid (DHA) essential? Lessons from DHA status regulation, our ancient diet, epidemiology and randomized controlled trials. J Nutr 2004; 134: 183-86. 5. Bowen RA, Clandinin MT. Maternal dietary 22:6n-3 is more effective than 18:3n-3 in increasing the 22:6n-3 content in phospholipids of glial cells from neonatal rat brain. Brit J Nutr 2005; 93: 601-11. 6. Peet MI, Glen I, Horrobin DF. Phospholipid spectrum disorder in psychiatry. Marius Press: Carnforth 1999. 8. Cordain L, Watkins BA, Mann NJ. Fatty acid composition and energy density of foods available to African hominids. Evolutionary implications for human brain development. World Rev Nutr Diet 2001; 90: 144-61. 9. Crawford MA, Casperd NM, Sinclair AJ. 1976. The long chain metabolites of linoleic and linolenic acids in liver and brains of herbivores and carnivores. Comp Biochem Physiol B 1976; 54: 395-401. 10. Crawford MA, Gale MM, Woodford, MH. Linoleic acid and linolenic acid elongation products in muscle tissue of Syncerus caffer and other ruminant species. Biochem J 1969; 115: 25-7. 11. Williams G, Crawford MA. Comparison of the fatty acid component in structural lipids from dolphins, zebra and giraffe: Possible evolutionary implications. J Zool 1987; 213: 673-84. 12. Broadhurst CL, Cunnane SC, Crawford MA. Rift Valley lake fish and shellfish provided brain-specific nutrition for early Homo. Brit J Nutr 1998; 79: 3-21. 13. Arterburn LM, Hall EB, Oken H. 2006. Distribution, interconversion, and dose response of n-3 fatty acids in humans. Am J Clin Nutr 2006; 83(6 Suppl): 1467S-1476S. acid supplementation and conversion to n-3 long-chain polyunsaturated fatty acids in humans. Prostaglandins Leukotrienes Essential Fatty Acids 2009; 80: 85-91. 15. Jensen CL, Lapillonne A. Docosahexaenoic acid and lactation. Prostaglandins Leukotreines Essential Fatty Acids 2009; 81: 175-8. 17. Malthus TR. An essay on the principle of population: As it affects the future improvement of society. 1798. In: Gilbert, Geoffrey. Eds. Oxford world's classics. Oxford University Press. 1999; p. 208. 18. Crawford M, Marsh D. The driving force: Food, evolution and the future. London: Heineman 1989. 19. Verhaegen M. In den beginne was het water: Nieuwste inzichten in de evolutie van de mens (In the beginning was the water: Newest insights into human evolution). Antwerp: Hadewijch 1997. 20. Cunnane SC. Survival of the fattest. The key to human brain evolution. Singapore: World Scientific Publishing 2005. 21. Horrobin D. The madness of Adam and Eve: How schizophrenia shaped humanity. London: Bantam Press 2001.